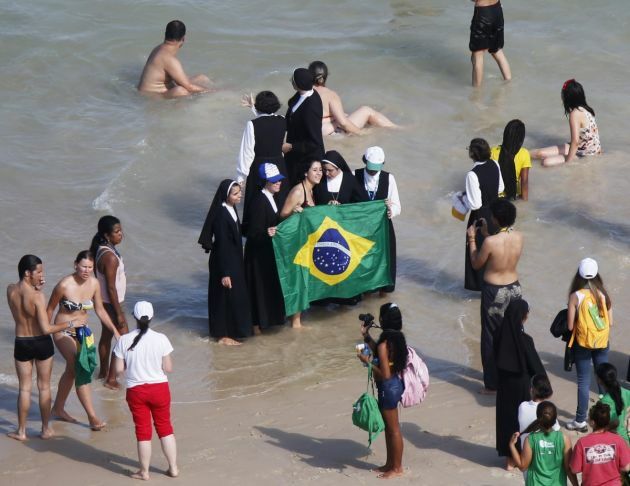 (Photo: REUTERS / Sergio Moraes)Catholic faithful and nuns pose for photographs after Pope Francis celebrated his final mass on Copacabana Beach in Rio de Janeiro, July 28, 2013. Pope Francis, in a stunningly candid assessment of the state of the Catholic Church, said on Saturday it should look in the mirror and ask why so many people are leaving the faith of their fathers. Four hundred archbishops, bishops and auxiliaries are gathering in Rio de Janiero during May to discuss how a shortage of priests is radically changing parish life across Brazil's 250 dioceses. "Many of our communities here in Brazil are not able to have daily, or even weekly or monthly Mass," Franciscan Bishop Elias James Manning, told Vatican Radio. Brazil is the country with the largest number of Catholics but census figures show their numbers slid from 125 million in 2000 to 123 million in 2010. The percentage of Brazilian Catholics in the same period slid from 74 percent to 65 percent while people saying they were evangelical Protestants and Pentecostals leapt from 26 million to 42 million. Bishop Manning who is a native of the United States first came to Brazil as a 24-year-old priest and has recently retired as Bishop of the diocese of Valença in the ecclesial province of Rio de Janiero. "The number of priests are not sufficient to take care of all of our communities so, here in Brazil, the lay ministers receive a lot of value," said Manning in the interview with Vatican Radio. The Catholic Church in Brazil has received permission to get lay help with some of the ministerial work normally done by priests. "We have received permission from Rome to have these qualified lay witnesses...the bishop can appoint these people. We have these ministries to help with the lack of priests in our diocese and parishes". Bishop Manning said the National Conference of Bishops of Brazil (Conferência Nacional dos Bispos do Brasil, CNBB) wants to move away from having large parish centers. This is to enhance networks of small communities that are popular in Brazil, especially in rural and jungle areas using lay ministers to aid often fatigued priests in forming their church communities. He noted how the communities meet weekly for bible study sessions and prayer groups led by lay catechists who teach the faith. The communities are empowered to carry on their life of faith in periods of weeks or months when a priest cannot be present. "We have to support more our communities," said Bishop Manning, "and create our parishes - big and small - as centers of community life, giving more values to small communities that are connected."